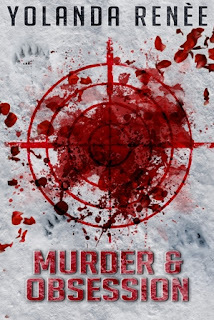 Zazzy means shiny or flashy - stylish... And only one character in Murder & Obsession fits that role. Alice Foxx, Sarah's nemesis and a woman who shows up during Sarah's memorial to make another claim on the unsuspecting Detective. Her perfume hit Steven’s senses a second before he saw Alice Foxx sashaying toward his table. He couldn’t even remember what he’d been saying as she drew closer and then planted herself between them. Her presence shocked Steven speechless. He had no idea Alice would come to Alaska for Sarah, a woman she hated. Her red dress and black fur coat were a bit pretentious for the event, but not for Alice’s personality. Alice had his complete attention, she smiled, and brushed a stray hair from his face, her touch made him cringe. He searched for the camera shooting the event hoping it missed the moment. Thank you for supporting my Thunderclap! I had to know what happened next! See you for the IWSG on Wednesday! Now there's a femme fatale! Thanks, Sophie, it's been fun! Hi, Lix, thanks, it was fun, it was interesting, but now it's over, and I"m thrilled! Congratulations to you too! I can't wait to get back to this book but right now I am going to start reading Memories of Murder today. And my expectations are very high after reading Murder, Madness & Love. Thanks for following all through the challenge - your posts were truly outstanding! She sounds like a real... I won't say it. Been fun reading the excerpts! See you next week. Thanks again for going above and beyond Ninja Minion duty. Yep, I'll be here for the IWSG! Than it's Happy May and a break before summer hits! Wow. Apologising with her hand on his thigh...insensitive to say the least...she's a piece of work for sure. Oh...and get some words down on paper too. Hi, Michelle, Alice is a lot of things, and she's based on a real character. Yes, it's a wrap. Thank you so much for all your support! You rock! I do hope you enjoy them, and yes, writing is my goal this summer too. I'm finishing my next book - there's no other option! Great finish to the challenge, Yolanda. I love the word 'zazzy'! Thanks for supporting my posts too! Hi, Susan, my pleasure. It's wonderful to be at the end. Congrats on making it all the way to Z. Really enjoyed your series. Hey, Samantha, thank you for sticking with me. And Happy Belated Birthday! April is the best month for birthdays and Super heroes! Sounds like she is one to stay far far away from. Congrats on making it to the end too! Hi, Ronel, thanks for your support and also for completing it with me! Especially liked your 'those who kept it short' haha so relate! Wish you lots of R & R and a great weekend. Yes, after Wednesday, lots of R & R! I hope you're taking advantage too! Then June comes the WEP! Alice sure sounds like trouble! It's been fun getting to know you and your writing through the A to Z Challenge. Thanks, Ellen, it was fun learning about you and your sailor life! What a hoot! You look good for a man who died in a bear attack. Loved it. And I've really enjoyed our visits this April. 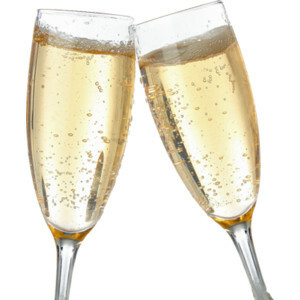 Good luck with your book and I'll be back after I have some of that Champagne. For all her zazziness, I did feel sorry for Alice. There's a deep insecurity there. I'd love to fix her :):) Congratulations on making it over the finish line of the A to Z. Thoroughly enjoyed reading your words! Have a lovely weekend and thank you for supporting me by visiting my blog. I very much appreciate it. Thank you, Nicola, I look forward to following your journey! Short, sweet, and to the point. I've enjoyed reading your posts. Well done. Thanks, Ryan, it was wonderful getting to know you too. Well, she is someone I'd be rolling my eyes at! Happy end to the A to Z Challenge, yes, catching up, but I will return! Thanks, Sam, you did a great job with EOS too, I even had it read before the end of the challenge. Great short, is there more to come? 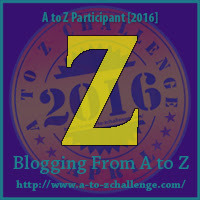 Congratulations on making it all the way through the A to Z Challenge! It's been a fun ride. I hope this month has brought much well-deserved attention to your books! Yay, we made it! I will never be zazzy, but that's okay. I love your use of zazzy and hate Alice, which I'm sure you intended. lol! When I think of "zazzy" I think of "Zazzle" -- what sheldon named one of his cats on the Big Bang Theory. Congrats on finishing the A-Z!! Woohoo!! That's a strong emotion, but dislike yeah, in a fun, like to dislike the character sort of way. LOL Whatever that means! Eeek... Alice sounds despicable. And it's not just the zazzy part (though maybe it did start there, haha)... She does come across as flippant here, and she seems to be throwing herself at Steven, which indicates either a total lack of empathy (she can't see he's repulsed by her), or she's so used to getting her own way in everything that she doesn't care how other people feel. Oh, and a key factor: I like Steven, so if he dislikes her to the point where her touch makes him cringe, that tells me she's not someone I should like. Or trust. Great excerpt, Yolanda. I've loved finding out more about this story, and I wish you every success with it. Congratulations on finishing the Challenge! Yes, in spite of the piles of laundry and unwashed dogs and dirty dishes languishing in the sink :D You did a fabulous, fabulous job. Thanks for the champagne Yolanda. I enjoyed both your blogs. I particularly liked those with info about Alaska. Congrats on seeing it through to the end!!!!! It was new to me too, I think it is a new words, maybe for the millennials? Congrats on finishing the A to Z. It doesn't bode well for the deceased when a floozy shows up to bid you farewell. . ..and says hello to your widowed husband. Enjoyed reading your posts, Yolanda! Thanks for visiting my blog!